DragonCoach1 Cerca del Rio Grande: Boy, we had a ball this year!! Boy, we had a ball this year!! Well teachers we made it through another year battered, bruised, singed, tapped out, flying high, still vertical and above ground (wow it has been a good year). As we look back over our shoulders to August 2011 can we say we met our set goals? Did we have to recalculate? For those of us who are blessed with great co-workers, God is good!! The physical education department on the Douglass campus was blessed with such an individual who transitioned from the middle school atmosphere to the world of elementary physical education (he made it through)! He appeared larger than life with his cool, calm demeanor (I wonder how many pro outfits he really has?) and straight to the point wit. He kept us all motivated and ready to do what it takes to meet the needs of our students. 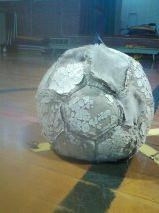 "This is our Soccer ball at the end of the school year at Douglas Elem. School in El Paso's Segundo Barrio (second Ward ~ low income).... This is dedicated to the have nothings, where we all came from. The barrio. At the end of the day, this ball found itself back to us one way or the other... We lost it, landed in the canal, threw it away (and got pulled out by someone), stayed over night on the yard.... but it found it's way back to our school....2 our kids. Like the rose that grew from concrete, nothing is beautiful about this ball, but it has character, endurance, heart, and will, just like our kids.... Some will conquer and achieve... the ball didn't give up, neither do our kids! Great School Year. Thank you ball.... somehow I feel the ball had it's own agenda. Someone up above was working his magic through the ball...... ;)"
Well said, Javier thank you for your patience, your up right character, and your willingness to play with us. Looking forward to seeing what else you have got up your sleeve, have a great summer. As a matter of fact everyone have a great summer, refresh, learn a new skill set or two to add to your teaching tool box.